The bacteria are the smallest and most primitive unicellular organisms. The structure of bacterial cell is very simple. The cell shows prokaryotic organization. The protoplasm of the cell is surrounded by a cell wall. Cell wall is made up of mainly polysaccharide(glucans, mannans, galactans) chitin, muramic acid and an amino acid diaminopimelic acid. The plant cells are more complex and advanced. 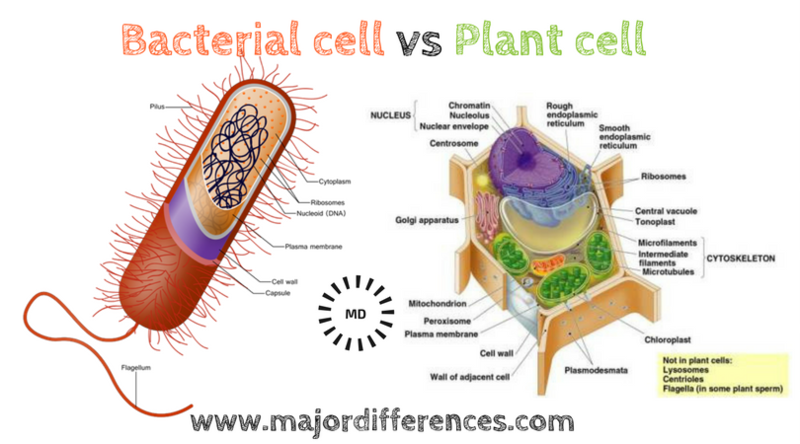 Plant cells are surrounded by a definite rigid, protective envelope called the cell wall. The wall is made up of chiefly cellulose, and often with some other materials (suberin, lignin, pectin etc.) in minor amounts. Cell is Prokaryotic. Cell is Eukaryotic. Cell wall is made up of polysaccharides, proteins and lipids. Cell wall made of cellulose. Plastids, mitochondria and other cell organelles are absent. Chloroplast absent. Mitochondria and plastids presents. Chloroplast present. Golgi bodies present. Nucleus not organized, without nuclear membrane, chromatin material free in cytoplasm Nucleus present, well organised, with membrane, chromosome occur within nucleus. This is great. Simple and right to the point very informative.